Drought is the major climatic threat that affects agriculture of arid areas. 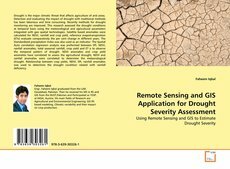 Detection and evaluating the impact of drought with traditional methods has been laborious and time consuming. Recently methods for drought monitoring are improved. This research assessed the drought conditions at temporal basis using the meteorological and agricultural parameters integrated with geo spatial technologies. Satellite based anomalies were calculated for NDVI, rainfall and crop yield, reference evapotranspiration (ETo) evaluate comparatively the per cent change in different years. The Standardized precipitation Index was also used as an indicator. The Spatial Auto correlation regression analysis was preformed between SPI, NDVI, rainfall anomalies, total seasonal rainfall, crop yield and ET o to observe the temporal pattern of drought. NDVI anomalies and crop yield anomalies have correlated to assess the agricultural drought, NDVI and rainfall anomalies were correlated to determine the meteorological drought. Relationship between crop yields, NDVI, SPI, rainfall anomalies was used to determine the drought condition related with rainfall deficiency.